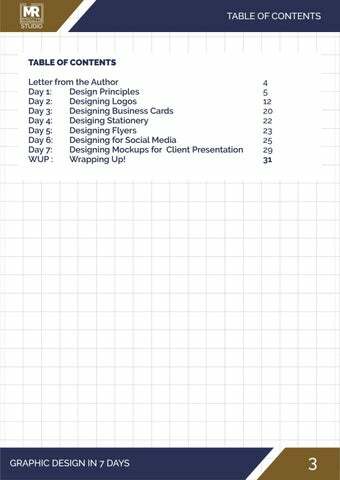 TABLE OF CONTENTS Letter from the Author Day 1: Design Principles Day 2: Designing Logos Day 3: Designing Business Cards Day 4: Desiging Stationery Day 5: Designing Flyers Day 6: Designing for Social Media Day 7: Designing Mockups for Client Presentation WUP : Wrapping Up! CONTRAST (continued...) Take a look at the business card example below, can you see just how CONTRAST directs the eye of the recipient of the card? You can do a lot of variations on this card to direct the attention of the reader. We will discuss Business Cards in Day 2.. COLORS Our minds are hardwired to respond to colors which tend to shape our perception of a design. The science of colors and the emotions they bring in is very important in the overall appeal of your design. RED Use the color RED when you want to convey a message of EXCITEMENT, YOUTHFULNESS, and Being BOLD. BLUE Blue is a calming color that instills a sense of AUTHORITY, SECURITY, and SUCCESS. Use BLUE to show TRUST and DEPENDABLE STRENGTH. GREEN Green is a peaceful and soothing color. Use GREEN to represent LIFE, RENEWAL, GROWTH, or HEALTH YELLOW The color YELLOW is an optimistic color. Use this to show WARMTH and CLARITY ORANGE Orange is CREATIVE and ENTHUSIASTIC. It resonates a FRIENDLY and CHEERFUL vibe. VIOLET / PURPLE Violet / Purple are rarely used colors but they represent CREATIVENESS and WISDOM. BROWN / BLACK / GRAY Brown indicates NATURE and UTILITY. Black represents POWER and SOPHISTICATION. GRAY is all about BALANCE and BEING CALM/NEUTRAL. All three are neutral colors and used to represent SIMPLICITY and NEUTRALITY. HINT: Take a look at different company logos and you can see just how each company uses COLOR to its full potential! COLORS (continued...) The amazing color wheel serves as a guide when using colors in the design. We have the primary colors, RED, BLUE, and YELLOW. Of these colors, when combined with each other, we come up with secondary colors, GREEN, PURPLE, and ORANGE. Tertiary colors are a combination of the primary and secondary colors which completes our wheel below. Black is the combination of all colors. WHITE is the absence of all colors. COLOR RELATIONSHIPS There are different Color modes found in Graphic design software. The most common is RGB and CMYK. CMYK is the mode used for printing. RGB is used for the screen of computers or mobile gadgets. In the color wheel, Complementing colors are placed opposite of each other and if you want your design to stand out, better stick to these complementary colors: Blue & Orange, Red & Green, Yellow & Purple, and so on. When three colors is a bare minimum in the design, look for Triads of pleasing colors. The primary colors, RED, YELLOW, and BLUE is perhaps the most popular triad found in children's books. What other triads of colors can you find in the color wheel? Use them well to create excitement in your design. You can also try Split complement triads: Yellow-violet-blueish purple? Green-red orange-violet? The possibilities are endless. Analogous colors are composed of colors next to each other. Using these colors creates Harmony with all its different shades (adding white or black to the color) or Tone (how bright or how dark the color is). You can also take a look at Pastel colors, most popular in wedding invitations. TYPOGRAPHY Perhaps the most crucial and vital component of the design is the Typography to use, or the FONT in computer terms. The rule of thumb is to use at most 2 types of font in the design. The safest way to go is to use a single FONT for the whole design, and use the C-R-A-P principles to catch the audience attention. DO NOT use fonts that look very similar to each other in the same design. As mentioned, use the lessons learned in the previous sections, specifically CONTRAST. TYPE CATEGORIES To date, there are thousands of different typefaces / fonts available and many more are being created everyday. Most of these can be categorized as follows: Serif Serif typefaces have the "serif" and based on handlettering. This type is perfect for PRINT projects. Further these can be grouped into: Oldstyle This typeface is based on the handlettering of scribes and replicated humanist pen strokes. There is a diagonal/slanted stress/serif in each letter. Modern This type has horizontal serifs. Script This type includes all typefaces that appears to be handlettered with a calligraphy pen or brush. Decorative Decorative fonts are fun, distinctive, easy to use, but their use is limited based on how serious or fun looking you want your design to be. When combining different typefaces, be sure to check with your own eyes if they COMPLEMENT each other and not CONFLICTING with each other. The typography can make or break the entire design, so be extra careful. You can use fonts that have different weights (Light, Thin, Regular, Medium, Bold, Black, Extra Black, etc.) in the same design to create contrast. DON'T pair a sans serif with another sans serif, and so on. Make sure to follow the C-R-A-P principle and that ends our Day 1! LOGOS After learning Design Principles in Day 1, you should now be ready to take on your first design challenge, the Company Logo! Logo design might seem to be an easy task but it actually is a very tricky one as you try to apply the design principles on Day 1. The Logo should conceptualize the story behind the brand that the company is trying to establish to its customers and stakeholders as well as tries to embody what the company stands for. In this section, you will learn the very basic essentials of a logo and how you can come up with your very first (or nth) logo using the basic guidelines required for an effective logo -- to be the visual representation of the company brand. The logo is just the tip of iceberg, that is the brand being established by the company which is the overall relationship with its customers. Take for example the logo above which the company BOLDVISION wanted to show that they are experts in their field /industry. A logo is important but the relationship that the company has with its customers as well as the reputation that the company establishes outweighs the logo in terms of importance. As a logo designer, your main focus should be on designing a graphic that clearly summarizes the value of the company in terms of what problems they solve. In the next sections on Day 2, we are going to dig deep into what a company logo should be and what should it not be. Where and how will the logo be used? Take a look at the sample logo below. Take a look at the logo above which was presented to the client. Their logo needs to be printed on a tarpaulin type which is horizontal in orientation. Additional elements (bubbles) were added to the design to preserve the proportion of the logo when stretched. A logo is what identifes a company by the use of a symbol, signature or mark. It doesnâ&#x20AC;&#x2122;t necessarily have to describe what a business does like in the previous examples, but it should represent the story of the brand and company. Logos are a unique identifer of the company, through colors, fonts and images, as they provide essential information allowing customers to relate with the companyâ&#x20AC;&#x2122;s brand bringing us to the next question to ask your client... What is your target audience / customer? Take a look at the next sample below. What customers does this attract? LOGOS (continued...) In the previous page, does the logo attract FUN-LOVING individuals because of the colors that they've used? Take for example the NIKE Logo with its signature CHECK icon, does it inspire you to do SPORTS? This brings us to the next question to ask your client... What message needs to be communicated to the target audience / customer? Take a look at the next sample below. What do you think is the message of their logo to their customers? Your design will depend on what message the company needs to communicate to their customers. Be it as professional, fun, or whatever values the company has, the logo tries to summarize all of them. It is important to note the industry that the client company is doing business in so as to take a look at their competition's logos before you start on theirs. Before you start sketching on your notebook or computer, it is important to know the different types of logos. In the Logo world, there are different types of Logos which the client can choose from. Wordmark Logos This type of logo relies on text, typeface, and unique typographic treatments to express the brandâ&#x20AC;&#x2122;s identity. Because there are no graphic elements to convey messaging, the text is often exactly literal, stating the name of the company and sometimes even what it does. LOGOS (continued...) Famous wordmark logos include Google, Coca Cola, Yahoo, Netflix, Home Depot, Wallmart, and so much more. This type works best when you have a very distinct name which people can later on relate to products and services. Take for example the sample logo below which the client wanted for their real estate investment company. This type also works best if you have limited marketing budget. Lettermark Logos Now what can you do if your company name is a bit long and an abbreviation or your company's initials are much more appropriate as a logo? Then you can use this type of logo. This type highlights the company's initials rather than the full name. Famous logos include IBM, HBO, CNN, EA, and many more. This type makes it easier for customers to remember or associate your brand with the company initials. Take for example the CNN logo which acts as a simple mnemonic device for the "CNN" brand. Combination Marks This logotype incorporate both text and a symbol and is the most commonly used logotype. Combination marks are much more complex to design and the symbol and text should go hand in hand for the overall appeal of the design. Famous logos include Pizza Hut, Adidas, Macy's and many more. Emblem type Logos (Text with the Symbol) This type involves placing text inside of a symbol so that the two are practically inseparable. This type is the most common choice of an official badge or seal, for government and political organizations as well as sports teams. They are also used by well-known private companies like Starbucks Coffee and Harley Davidson. Balance The most often ignored in designing a logo is the Balance between the icon/symbol and the text. The entire design should flow nicely, with the style of the typeface matching the style of the iconic mark. The logo should also make effective and consistent use of spacing and/or negative space (blank space). Colors Color choice is important in the context of branding. No more than 2 colors should be chosen for logo. Colors should be chosen based on the complementing colors of the color wheel. This rule might be broken if the client wants to have a myriad of colors or on mascot type of logos and abstract logos. HINT: I included in this eBook some references on the science of colors. Typography Use only fonts that you have commercial license of specially for nonpersonal projects. There are a ton of fonts commonly used in Logos. The most common type of fonts are Sans and Sans Serif. With some logos having Script, Decorative, or Display Fonts. Design your First (or Nth) Logo You can find in the zip file a template for a vintage logo designed for a design contest (HINT: Watch out for my next ebook on Winning Design Contests). As parting words, avoid industry cliches and DO NOT design DERIVATIVE logos to stay out of trouble. Avoid using a 12point size font and do not attempt to fill up all of the empty space. Words such as email, web site, phone number are not necessary, it's clear what they are. You can try to make the last line BOLD or different to create CONTRAST and direct the eye of the reader from top to bottom. People read in a "Z" fashion. BUSINESS CARDS (continued...) Make sure to align everything up. Use Colors that are the same or complementing with your logo. Most of the time, a LEFT or RIGHT alignment is stronger than a CENTERED one, but this depends on the overall look of the design. Business Cards are challenging to design because of the amount of information that needs to be put into a small space. Business Cards can be printed on one side or back-to-back. You can have it in horizontal or vertical orientation. Rounded edges or straight? Choose one that works best with the information and graphics at hand. If you plan to create a letterhead / stationery with matching envelopes, make sure to create a consistent image (branding) on all pieces. This wraps up our Day 3. You can spend the rest of the day going back to the previous sections or try designing more business cards with different logos! STATIONERY After desiging your logo and your business card, it is quite as important to complete your branding package which includes the Letterhead and envelopes. From the quality of the paper you choose, to the design, color, typeface, and matching envelope, the message to be communicated to the customer should be consistent and inspire confidence in your company's / client's business. Use a single arrangement on both the business card, letterhead and envelope. All three items should look like they belong together. Don't try to center everything on the page. Be Creative. Be Clear with the message. Create a focal point which could be the Logo. Standard envelope size is 9.5 x 4.125 inches or #10 envelope. European size is 110 mm x 220 mm or C4 envelope. If there is a need for a second page, you can take a small element like the logo, make it smaller than the first page but be consistent with the alignment, so it appears the transition between the first and second page is as smooth as possible. Day 4 lesson is done! You can review the previous lessons and sleep well for Day 5! FLYERS Flyers maybe one of the most fun to create as you can be as CREATIVE and CRAZY at the same time. It is a great outlet for your overflowing desire to design! Often these flyers are handed out on the streets, at your local supermarket, or even posted on a bulletin board with dozens of other flyers competing for the reader's attention. One of the best ways to call attention is to design a very catchy headline. Grab one or two stock images from the Internet. Make the typography as HUGE as possible. The possibilities are endless! There are no standard sizes for flyers. Again, apply the C-R-A-P principles we have learned in Day 1. You can even use MS WORD or POWERPOINT to design a flyer. Althought it is best to use a Desktop publishing software such as Adobe InDesign, MS Publisher, or the upcoming Affinity Publisher. Vector software is also preferred by some. 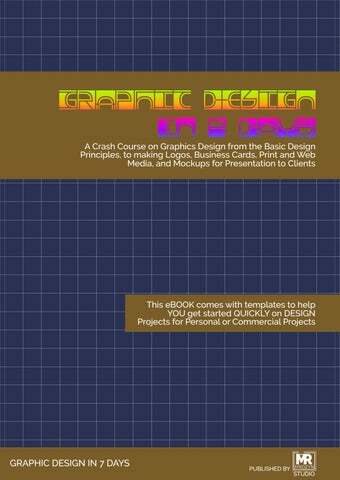 Sample templates are available on the internet (and this book). FLYERS (continued...) One of the most common mistakes of new designers when designing flyers is the lack of hierarchy in presenting information. Remember the Z fashion that readers read information? Create a focal / starting point and continue to "tell the story" from there. Use logo colors, if possible, but as we earlier said, flyers can be designed as wildly as possible. Make sure to be guided by all of the C-R-A-P Design Principles in Day 1. Pick an appropriate font and be consistent all throughout. Use bullet points appropriately and make sure there is BALANCE as with the Logo design guidelines in Day 2. Take advantage of the emotions created by colors. Be CREATIVE and DESIGN MORE. Day 5 is over, Rest Well and see you tomorrow. DESIGNING FOR SOCIAL MEDIA Perhaps, one of the most sought after designs in recent years is designing for social media. With the millions of users on Facebook, Twitter, Instagram, Youtube, and more social media sites, companies have been turning to digital content to engage and communicate with their customers. Design with mobile in mind. DESIGNING FOR SOCIAL MEDIA - Facebook (continued...) Shared Images recommended upload size is at 1200x630 pixels. Highlighted Images recommended upload size is at 1200 x 717px but will appear in page at 843 x 504 pixels. Choose high resolution photos Shared link recommended upload size of 1200 x 627px Facebook will scale photos below minimum dimension of 116 x 116px Event Image similar to a facebook cover photo. recommended upload size of 1920 x 1080 px, scales down to 470 x 174 pixels on feed Perhaps the most popular site for Professionals and Companies, Linkedin users have nearly doubled in the past years or so. 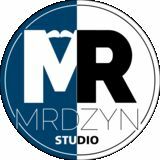 Profile Image / Company Logo recommended size of 400 x 400 px and maximum of 20,000px. Maximum of 4-10MB file size. Can be JPG, PNG, or GIF. Personal Background Image recommended size of 1584 x 396 px Company Brand Image recommended size of 1536 x 768 px, minimum of 1192 x 220px. Can be JPG, PNG, or GIF. DESIGNING FOR SOCIAL MEDIA (continued...) Twitter Perhaps the most popular "News" site! Header Photo recommended upload size is at 1500x500 pixels. Profile Photo recommended upload size is at 400 x 400 px. Displays at 200x200px In-stream Photo upload size of 440 x 220 px (max file size of 3-5mb) Pinterest The most popular bookmark app! Profile Image recommended upload size is at 165x165 pixels. Appears at 32x32px Board Display upload size of 222x150 px. Thumbnails are at 55x55px Pin sizes - width of 236px Tumbler Profile Image - 128 x 128 px Photo thumbnails - 500 x 750 px Photo size - 1280 x 1920 px (maximum) Please refer to the template in this book for the canvas sizes for each of the social media sites mentioned above. That wraps up our Day 6! DESIGNING MOCKUPS FOR CLIENT PRESENTATION It is now Day 7 of our Graphic Design lessons, and so far we have already learned the Design Principles which we applied to Logos, Business Cards, Stationery, Flyers, and Social Media Graphics. 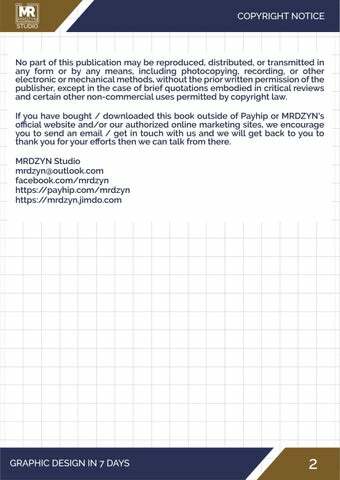 We are now ready to present the design to the client or to the company that we are designing for. Mockups are extremely vital in order to present clearly to the client all of the designs that we have made. There are actually free mockups on the Internet, usually in PSD format. Most are using the SMART OBJECTS feature available in Adobe Photoshop. You can use other graphic design software or even MS Powerpoint to present your designs. There are no hard and fast rules to presenting. Make use of the PERSPECTIVE tool to add some depth into the design. Add TEXTURES and shading to make it look as REALISTIC as possible. As mentioned in the previous sections, mockups are great to test the overall versatility of the design in various backgrounds. Take a look at this client presentation mockup for a logo designed for a design contest. Notice that it is easier to present the logo design when it is put into a mockup for branding (stationery, business cards) and a billboard sign. Presentation of ideas should be like telling the story of the brand through images, slides, or videos. The medium in which the design will be used is very important. Please refer to the next page for the next set of examples. DESIGNING MOCKUPS (Continued...) Mockups are extremely useful for Print Materials like Flyers, Brochures (HINT: watchout for my next ebook, Graphic Design After 7 Days soon), Posters, Invitation Cards, etc. as well as Web Design and Social Media. Mockups are required for TShirt Design. Use a mockup to place the design on a shirt so that the client can easily check if the design will SELL. There are many free mockup templates on the web.